We are gradually resolving our distribution challenges. 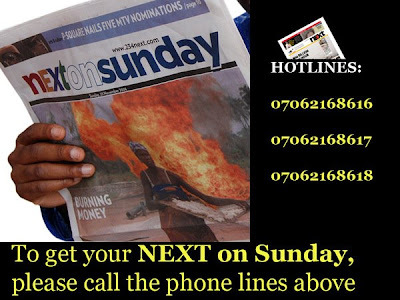 To buy your copy of NEXT on Sunday tomorrow, go to your nearest vendor (in Lagos and Abuja), or call the numbers to the left. The paper should be readily available, and yours for N200. NEXT's daily edition (compact size) will be on sale in all good newsagents (Menzies, WH Smith etc) in London from this Monday. Call 020 7928 5443. (the London distributor company) to find out where you can pick up a copy. Any numbers for UK readers, thanks in advance. so i read it this morning and I must say color me impressed. A Nigerian paper that makes an effort to differentiate between opinion and fact is a breath of fresh air in my opinion. Hope the good work continues. I must confess to being curious as pero the economics of producing something of that quality and pricing it at the same level as Thisday sunday. Took a taxi ride in Lagos last week and he's never heard of NEXT. Not a good sign. Next is now full of spelling and grammatical errors. If nothing is done about this charade, Next will prove to be yet another "Nigerian newpaper", business as usual. Jeremy, PLEASE DO SOMETHING ABOUT IT.